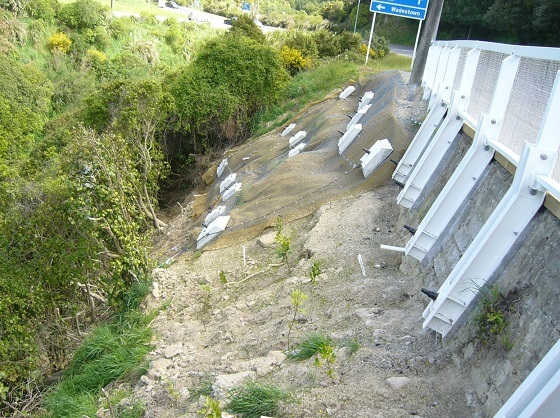 In May 2012, BBR Contech was engaged to carry out strengthening work to two retaining walls and the adjacent slope on this high priority arterial road. The purpose of the strengthening work was to improve the road performance in natural hazard events, in particular earthquake and storm events, and minimise the consequential disruption to the road users and the community at large. More than 50 double corrosion protected ground anchors were installed as part of the strengthening work, including installation of steel grillage and wire mesh across the face of existing retaining walls and adjacent slope. Churchill Drive is one of the high priority arterial roads in the Wellington road network and carries about 8,000 vehicles per day. An elaborate temporary traffic management plan was implemented to minimise disruption to vehicle and pedestrian traffic during the contract works. Also a number of services were identified on site including 11kV cables, water main, fibre optic and telephone cable and extra care was required to ensure that the anchoring work did not affect these services. This complex anchoring project was completed on time and within the budget to the satisfaction of all the stakeholders.